The cart arrived a day early! It is beautifully made. A friend put it together for me and it was easy to assemble. 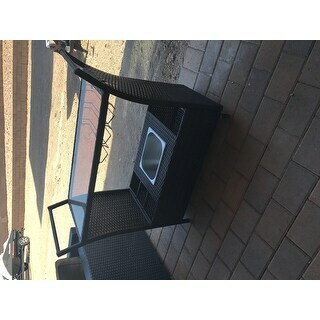 It's the perfect size for my patio and is an excellent match to my other wicker pieces. The 3 bottle holders and the ice bucket are perfectly sized! 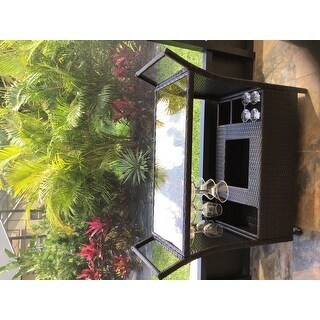 Have a blast entertaining your guests with this Bahama Outdoor Aluminum Bar Cart. Perfect for holding snacks and beverages, this cart features a removable ice bucket and is constructed with wheels for easy movement. The extra storage space in the bottom is complimented by a flat top for an attractive look. This is a beautiful cart. Easy to put together and with good instructions. BUT I HAVE A PROBLEM: THE GLASS COVER WAS SHUTTERED when I opened the package. I am giving the cart 5 stars because the broken glass is a delivery issue and the cart is just right for my needs. I put a wooden shelf that accidentally fit just right and even so was beautiful. The stainless steel tray for ice is of excellent quality and the wheels actually roll effortless. Unfortunately I needed the cart for a party so I did not returned the item. I still have to call Overstock to see what I can do about the glass but reading the reviews it seems that their customer service department is terrific. I will report on that later. Extremely happy with my decision to purchase the Bahama Bar Cart. It is so functional and very easy to move around. I love that I have plenty of room on the top for my blender and things with having the removable ice bucket underneath and the other compartments that can hold your bottles. When not being used on my outside patio, my bar sits inside in my dining room and looks great (as it matches my home decor) and is usable! Again, we love our bar. Great purchase and I would definitely recommend buying one. Goes well with my swoopy chaise lounges and looks great. have had for more than a year and stands up well to the Bright Florida sun . I have brightly colored plastic glasses to accent from the hanging rack. The ice bucket compartment is a great feature to have. I love this product. It lives on my screened in patio. It matches my previously purchased patio lounge set perfectly. I use this ALL the time, especially when hosting parties and holiday gatherings. I really enjoy styling this little bar cart. 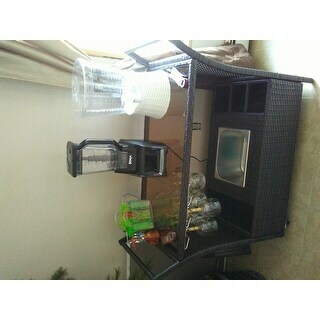 It's so perfect for a self serve beverage station, so I'm not having to run around getting drinks. It's very well made, I've had this for over a year now and it looks like the first day I got it. Bonus is the ice bucket and the glass holder. Just can't say enough good things about this. If you're thinking about it, just do it. You won't regret it! 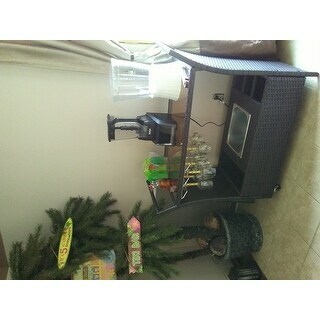 We are very pleased with the Bahama Bar Cart. The cart was packaged very securely and took no time to put together. The brozed smoked glass top adds an upscale touch, and makes it look expensive. There were several similar carts to choose from but I am glad that I got this one, it's perfect for entertaining outdoors or inside. We used it at our recent BBQ and received several compliments. 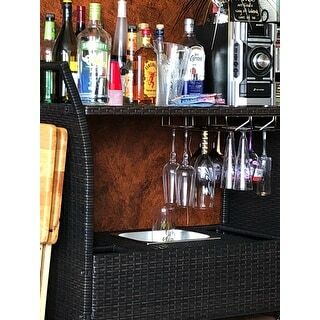 Absolutely love this bar cart. It is bigger than I imagined and is a great looking piece of furniture. I highly recommend this bar cart for your summer outdoor entertainment. Bought this bar cart to match my outdoor sectional and it was the perfect color. This cart is made of high quality material and was very easy to put together, not many parts. It will be perfect for my outdoor entertaining and family Happy Hour. 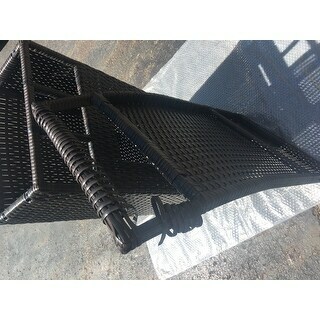 very sturdy, perfect for an outdoor patio, delivered very quickly and very easily put together. Love the cart, but I wish I would have opened the package sooner. The handle on the one side was “unraveled”. We had a graduation party for my daughter, so I didn’t want the hassle of returning it, so I used Gorilla Glue Clear tape to fix it. I hope it holds up on our back covered lanai, since that obviously happened sitting in a box. Absolutely beautiful cart, heavy and sturdy and well made and super easy to put together with easy to understand instructions. The glass is also good quality, thick, heavy and tempered glass, tinted too. I love the whole thing, it looks great on my balcony. I love this better then I could have imagined it matches the couches I put from the Christopher line perfect. Very durable and just looks so classy. very functional and great looking ... Drinks anyone !!! 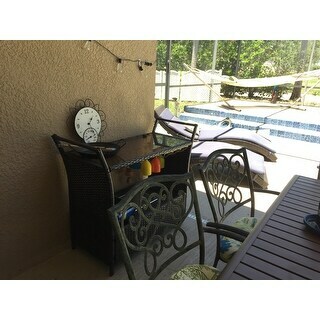 Love my wicker bar cart it is a wonderful addition to my patio! 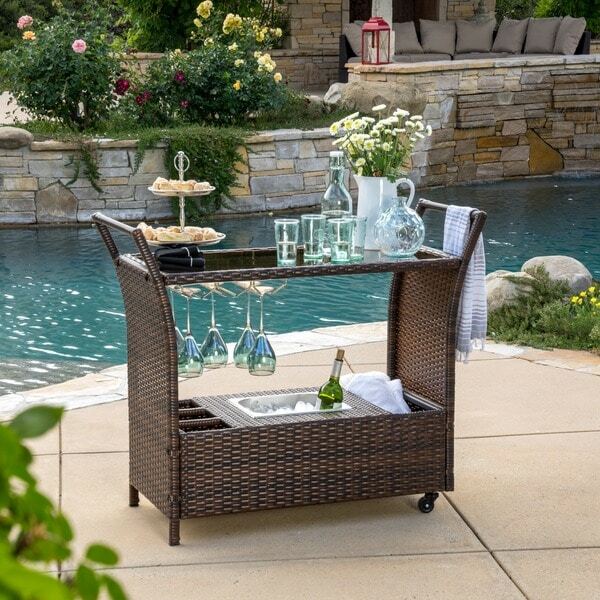 I have received so many wonderful compliments from many friends and family about this wicker patio bar cart! We have this on our bird cage. It holds up well in the rain. We had a large cocktail party and it was perfect. We put ice in the bottom bin (missing in the pic), had ice and wine in another container on top along with beer and soda throughout. Couldn’t be happier with it. I especially like that it had two wheels and can be moved with very little effort. Screws that come with is not strong. This is exactly what we were looking for. It is both functional and decorative. We were surprised that water does not seem to collect in the stainless steel ice bucket even after it rains. Assembly was reassigned able. I would not hesitate to recommend . "Is this item made a regular wicker or resin wicker?" It is heavy duty wicker - with a coating for weather so perhaps it is resin wicker. Very classic and classy look to the cart. I get compliments on it every time people see it. "What color is the glass for the dark brown one? It looks like it has a Brown tint to it." I believe it is a bronze color glass - very classy looking. "Is there a way to order a replacement top?" The top is not sold separately, if they are within warranty, we can look into sending a replacement. "How much weight can the glass top hold? Looking to put one of those glass drink dispensers with the spigot on top." We didn't test the top for weight capacity and we don't recommend putting a glass drink dispenser as it may be too heavy. "Is there a cover for it?" "Is this really natural wicker, not resin wicker?" "what are the dimensions and capacity of the ice bucket? does it come with a spout to drain the water?" I'm traveling so I can't give you exact dimensions except to say it's a good size and there's no spout for draining but it's not difficult to empty the water. I'm not sure of the exact measurements, but it is roughly 9in x 9in. And maybe 4in deep. It doesn't have a drainage spout, you just lift it out and pour out the water. Easy. The ice bucket lifts out easily to empty.